« Is it a Mid-Life Crisis or Something Else? cassette can’t spoil the fun! Happy Labor Day to all! I hope everyone enjoys this last holiday weekend before the autumn season starts. Yesterday was another exciting day spent in the Iowa City biking, cooking, and camping. There is also a recipe I wanted to share with the readers for something that is fun and easy to cook over about any heat source you can imagine. More about that later. Sunday was a good day to just ride around Iowa City and do some people watching. It was a blast. This vibrant, culturally diverse city is interesting at any hour of any day. I like to sit at an area called the pedestrian mall and watch the whole world go by! 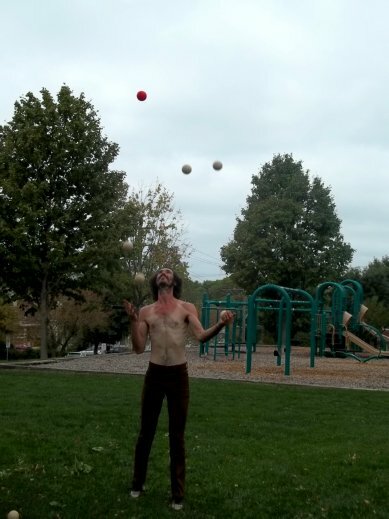 While riding through a park in the downtown area, I noticed a tall, thin hippie with a bad suntan who was juggling balls. Meet Luthor, a world traveler. Luthor recently returned from Scotland where he performed his juggling as a means for support and to further his travels. We chatted for quite a while about his travels and my own treks. Luthor was kind enough to let me snap this photo. He told me that he can actually juggle up to seven balls at one time. Amazing! As we finished a most enjoyable conversation, I gave him a little money for the road… something to thank him for the entertainment he provided us. What a cool guy! Since many of the folks who visit this blog are interested in vandwelling, RV living, or just wishing for this lifestyle, it seemed like Luthor was the kind of person many of us would like to be… carefree and laid back. From the Luthor visit, it was only a couple of blocks down the hill to the New Pioneer Co-op. (a.k.a. “New Pi” to the locals. The co-op is a fresh food store with some of the most awesome fresh organic produce and baked products imaginable. As is a new tradition (thanks to D. from Canada), I chugged a Zevia Black Cherry soda (an alternative to NutraSweet laced Diet Coke). It is good stuff! New Pi had the most amazing corn / cheddar / cream cheese veggie scones. The one purchased lasted most of the day; I treasured it like a fluffy tailed squirrel nibbling an acorn. The ride back to the campground was warm but the sunlight felt less intense than a couple of months ago. The air sort of smelled like fall – that pleasant odor like dry leaves and like toasted corn. Perhaps it was just the ragweed in the air. Nonetheless, it was a comfortable, relaxing feeling and one could sense that autumn is just around the corner. While biking, I stopped it at El Paso, a Mexican grocery store and talked to Carlos and Irma (prounced EAR-muh). Irma and I are friends from years back. She is a tiny little lady with an outgoing personality. Irma speaks as much with her twinkling eyes and smile as she does with the rapid-fire Spanish. We always joke about being “birds on a wire” – a colloquialism for people who like to gossip. Isn’t that the most cool metaphor? From speaking with Honduran and Mexican friends, the phrase is widely used. It seems to have universal applicability. Irma and I talked about the restaurant community, who got deported, who divorced who, the usual stuff. When she heard that fajitas were on the camping menu, Irma recommended a good seasoning. As much as I wanted to take their pictures, Irma and Carlos declined the offer. 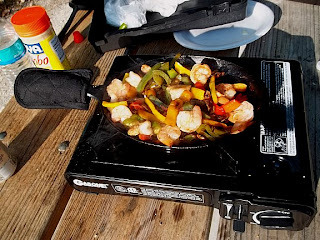 Here is what was cooked for supper – Shrimp Fajitas, diabetic style… I don’t use rice or beans due to the carbs, but you certainly can. Also, I only use one wrap – a high fiber, low carb tortilla which is perfect for most diabetics (unless you have a wheat gluten problem). The seasoning was Goya Adobo, a very common product you can find in many grocery stores with a Latino section. Otherwise, a little Mexican market will likely have it. If you can’t locate Goya, use a little regular seasoning salt. Optional – jalapeno peppers. Go sparingly if using fresh – maybe 1/2 pepper at the most. I use a couple but it makes the dish very spicy. In a skillet, cook the shrimp and garlic in olive oil over medium high heat for just a couple of minutes. Set aside. Cook the onions and peppers a little slower till the veggies start to soften and the onions are caramelized. Add more Goya seasoning as desired. Squeeze a little fresh lemon juice (optional) at the end of cooking if desired. is a camper’s best cooking friend! The shrimp fajitas really hit the spot! It was tasty to serve it will a little sour cream, ranch-flavored chip dip on a low carb tortilla. Chip dip? Yep! This stuff is sour cream based and with it already having some extra added flavor, it works great on nearly any wrap or even on eggs! 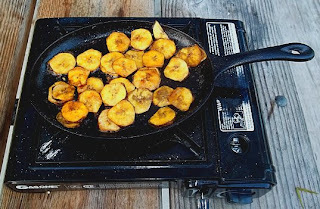 Later in the evening the stomach growled a bit so I cooked something fun and fairly healthy for dessert – plantain chips! Irma and Carlos sold me a large green plantain. For those not familiar, it looks like a giant green banana with a very tough skin. You just peel the skin and cut the plantain into thin “coins”. (You can use a regular banana, too.) Then using the butane stove and some non-stick spray, I lightly browned the chips. In the van there is a good sized spice container of “cinnamon sugar”. I sprinkled some on the chips as they cooked. The juices caramelized with the cinnamon and sugar and … voila! What a tasty dessert! Surprisingly, there was no discernible impact on the blood sugar. After watching a re-run of the Columbo TV show, about 9:00 I decided to ride 7 miles back into town and put some more miles on the bike. 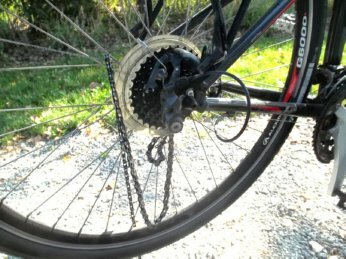 On the edge of Iowa City the chain snapped under load and destroyed the derailleur and gear cassette. It’s a very costly failure. Thankfully, the Trek bike should still be under warranty. Sadly, this bike has broken down frequently – lately on every major trip. I just hope they will fix it up – or give me credit to get one that will hold up! Today the plan is to slow smoke some chicken and a pork roast in a tiny little grill. With the bike out of commission, walking for fitness is an option. During the weekend, there has been a lot on my mind including the future of this blog. An article that I read stated that blogs should be helpful. This blog started with thoughts and “how to” articles about van dwelling but lately it’s transitioned to mostly trip notes and cooking ideas. That might be a good thing. Would it be helpful to make a section of just easy and tasty camping recipes with a clickable link? As always, thank you for stopping by to read the latest musings. Please let me know if there is any other content you would like to see on this blog or if perhaps you might be interested in writing a guest post to get exposure for your own blog. So Brad, how did the bike chain break? Just wear and tear, or did something out of the ordinary happen? The bike failed while under a load climbing a steep incline. It jumped out of gear just as I was applying maximum torque. It wound the derailleur around, braking it. The cassette is smashed, too. Ouch – you must have really been laying into it! I bet that’s gonna cost a few duckets to fix – hope it’s not TOO expensive! Thanks for adding me to your blog list….. I installed my new Inverter today, always very nerve racking to see if the thing works & won’t burn down the trailer with my home made wiring methods. Not to even speak of electrocuting myself with 400 amps. JUST KIDDING, normally my wires are larger & my fuses are smaller just to be tipple sure, after all I can’t run out and buy another model when something happens. I just have to get around to cutting all those factory 30′ wires loops down to what I actually need. One of the tricks to blogging is to post something every few days, make it easy for readers to leave comments, share ideas on other blogs, get sites to refer you etc … looks to me like your doing pretty good job so far…..
Don’t know if I’ll ever get to hit the road with the worlds most expensive over built cargo trailer ? As I sorta still like working too, helping others, fixing & building stuff, making money to buy junk and keeping others working. My new model may be to do more blogging , do some repairs on homes as there are 144 million of them out there – when people see my trailer – they don’t need to ask what I can do. Having a recipe link is a great idea! LOVE the blog “as is”…please don’t change anything, unless you are inspired to do so! From L.A., I agree…keep on truckin’! And tell us more about the cast-iron skillet. You can’t wash it, right? How do you clean it and store it? And would a caster-brake kind of bike benefit an older camper? You defintely want to cook with a little fat with each use to keep the iron seasoned. I like the small size of the skillet – it’s just the right size for fajitas or even just to make a few fried potatoes and eggs in the morning.